Automated Trading through the use of a Betting Bot is becoming a must-have strategy. It leaves the placing of bets to a reliable software application. The use of Betting Bots on Betting Exchanges is a game-changer for the average punter. Fast and accurate placing of bets is possible without any input from the bettor. After the initial set-up of the automated trading software the bot gets to work. 1. Testing betting strategies in simulation mode without risking money. 2. Bots calculate correct stake and place bets much faster than a person could. 3. Bots save you time, they work 24 hours per day, 7 days a week, you set them and leave them working. The bots can run for days unattended. 4. 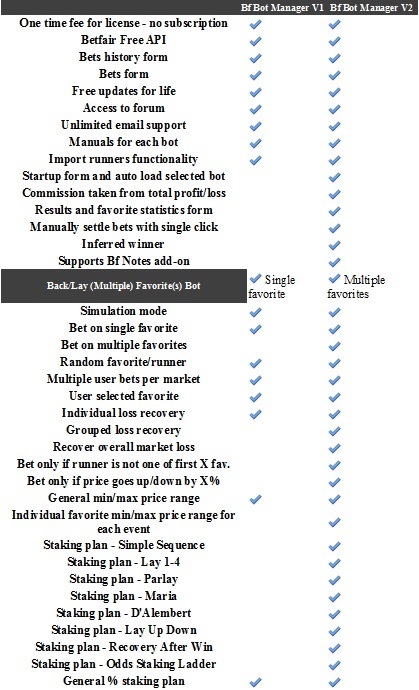 Bots keep a history of placed bets for customer analysis. 5. Results are also saved, which you can export and analyse e.g. favourite wins/losses, prices etc. 6. It is possible to order a custom Bot or new custom conditions. Thus an existing or new custom Bot works exactly to customer specifications. 7. Since 2008 the Bots improve, are reliable, tested and work without error. Bugs are very rare and if there are any then they are usually fixed within a few days. 8. Updates publish on an ongoing basis and a history of all past updates is available. 9. Email support is fast (usually within an hour). Only because of time zone difference may there be a delay of a few hours. 10. Active Forum for sharing of ideas and strategies. One strategy I like is the arbitrage facility using the Dutching Bot. By setting up the bot to trade on both back and lay markets it is possible to guarantee a profit. Update 3.0.5 for Bf Bot Manager V3 is available.